Air-conditioning units are a safety factor because the driver’s responsiveness and concentration levels drop considerably in overheated vehicle cabs. On the other hand, an optimally set air-conditioning unit ensures maximum driving safety with a pleasant working climate; even in high temperatures. The task of an air-conditioning unit is to extract the heat from the ambient air and therefore regulate the temperature of the air. Furthermore, it draws moisture out of the air and therefore prevents windows steaming up. The compressor vacuums the gaseous coolant from the evaporator and condenses it. From here, the coolant flows to the condenser which is situated in front of the vehicle cooler. In the condenser, the gas is cooled by the external air and is thereby liquefied. The heat extracted from the coolant is emitted into the ambient air at this point. The dryer then collects the liquefied coolant and frees it of moisture and dirt. The coolant is expanded using the expansion valve and injected into the evaporator where it then condenses. Due to the low pressure and absorption of ambient heat, the coolant is heated and therefore becomes gaseous. The cooled air then enters the interior of the vehicle and reduces the air temperature. We recommend regular maintenance of air-conditioning units. 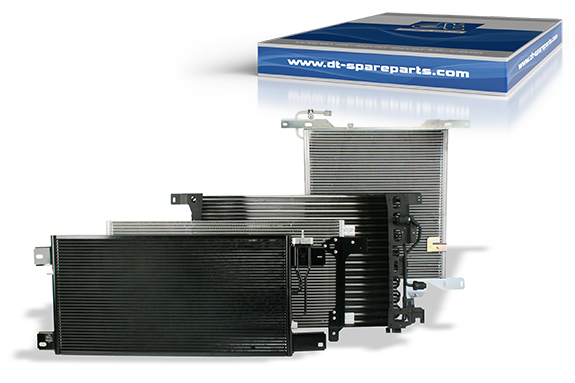 Transports the coolant through the air-conditioning system. It vacuums the coolant in a gaseous state in order to transfer it condensed under high pressure to the condenser. It has the task of cooling the heated, pressurised coolant. The heat is emitted in the ambient air through cooling fins. The pressure of the coolant reduces due to cooling and the state of the aggregate changes from gaseous to liquid. The dryer has the job of cleaning the coolant and extracting the moisture from it. The filter dryer only has a certain capacity for the collection of fluid. The dryer should therefore be exchanged during each repair or maintenance. The expansion valve takes the fluid coolant from the high-pressure to the low-pressure area. It controls the injected amount of coolant using the thermal load. The pressurised coolant expands in the evaporator. It then changes from the fluid to the gaseous state. The created evaporation cold is emitted into the ambience and conducted into the interior of the vehicle using the large evaporator surface.